Mr Yeo told BBC News: "Dr Pachauri has become a liability - he is now causing more harm than good. Climate science needs a guarantee of utmost reliability, and Dr Pachauri can no longer guarantee that. It would be as well if he stepped aside." Professor Hulme said: "Whatever merit his leadership of IPCC has had in the past, Dr Pachauri is unfortunately now associated with controversy and error in the IPCC AR4." "As clearly implied by the IAC Review, a new chair for AR5 would bring fresh vitality and a new respect to the IPCC." The IPCC has admitted it made a mistake in its 2007 assessment - known as AR4 - in asserting that Himalayan glaciers could disappear by 2035. But it says this error did not change the broad picture of man-made climate change. The chairman's fate will be decided by a meeting of the IPCC in South Korea next month. BBC News understands that the government representatives overseeing the IPCC are reluctant to oust him for fear of upsetting India - a major player in climate talks and a growing superpower. The UK government told BBC News that it was not explicit in the IAC report that a current chair of the IPCC should resign before the current assessment report is finished. But Professor Brian Hoskins, a Royal Society Fellow who reviewed the IAC report, said that speedy resignation was the obvious intention of the IAC. "The IAC recommendation is subtle," he said. "But it probably would be better for the future of the IPCC if Dr Pachauri were to resign of his own accord, taking great care to ensure that there is no question of India losing face as India is such a major country for mitigation (of emissions) and adaptation (to climate change)." Most other commentators contacted by BBC News shared the view that the IAC intended Professor Pachauri to leave now rather than wait until the end of his term. Most hoped that he would choose to resign in accordance with the IAC report and forestall any diplomatic row. Fred Pearce, veteran environment author for New Scientist: "I do not normally favour calling for people to resign. But in this case it is obvious that the IAC intends Pachauri to go, even though it's not explicit. So it may not be entirely fair, but for the sake of the IPCC it would be better if he resigns." Geoffrey Lean, the long-serving environment correspondent, now on the Daily Telegraph: "The time passed some while ago in which Pauchari ceased to be an asset to the IPCC and became a liability." The UK director of Greenpeace John Sauven told The Times in February: "The IPCC needs to regain credibility. Is that going to happen with Pachauri [as chairman]? I don't think so. We need someone held in high regard who has extremely good judgment and is seen by the global public as someone on their side." I understand this is still his view, although he has been discouraged by Greenpeace International from taking a stance on the issue. Of all the commentators contacted by BBC News only former government adviser Tom Burke insisted that Dr Pachauri should serve out his full term. "It's important not to give a trophy to sceptics," he said. 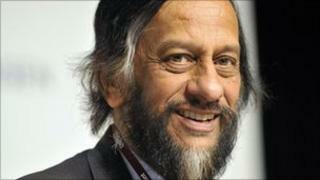 "Pachauri has not done a very good job and should not have been appointed for a second term," he said. "But he's here now and should finish the job (of AR5 - the IPCC's next climate assessment)." Tony Juniper, former head of Friends of the Earth said: "It is very important that this is handled sensitively and that any impression of faults with climate science are avoided. "But it is probably best for the IPCC if the current chair ponders on his very considerable achievements and decides of his own accord to pass the baton to someone else to complete the work on AR5. It seems clear to me that this is what the Inter Academy Council intended." George Monbiot has angrily refuted allegations in right-wing newspapers that Dr Pachauri has profiteered from his IPCC office. But he also called on the IPCC chair to resign to protect the reputation of the UN body. Foremost in the minds of commentators concerned about climate change is the fear that sceptics will use Dr Pachauri's continued presence on the IPCC to undermine the next report, AR5. Former Cabinet Secretary Andrew Turnbull was calling for Dr Pachauri's resignation in his foreword to a recent report from the sceptical think-tank, the Global Warming Policy Foundation.